Typically growing to about 50cm tall, Dropwort is a perennial herb that propagates both by means of seeds and via creeping underground rhizomes. The leaves of Dropwort are very finely divided and fern-like. This wildflower has a sweet and pleasant scent when the flowers first open, but it becomes stronger and almost obnoxious as the flowers fade. The stems and leaves are also fragrant but their smell is subtly different from that of the flowers. Common and widespread in Britain and Ireland, Meadowsweet is native to Europe and western Asia and has been introduced to other parts of the world including North America, where it has become naturalised. At its best in sunlit places beside ditches, pondsand streams, Meadowsweet is also commonly seen on roadside verges and woodland edges as well as in damp meadows. 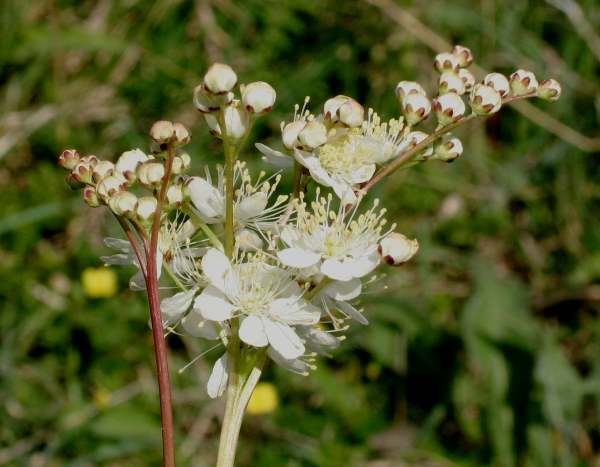 In Britain and Ireland Meadowsweet has an long flowering season, beginning in late May or early June and often continuing well in to October. The flowers of Dropwort are very attractive and are sometimes planted in gardens, from where they readily escape into the wild. 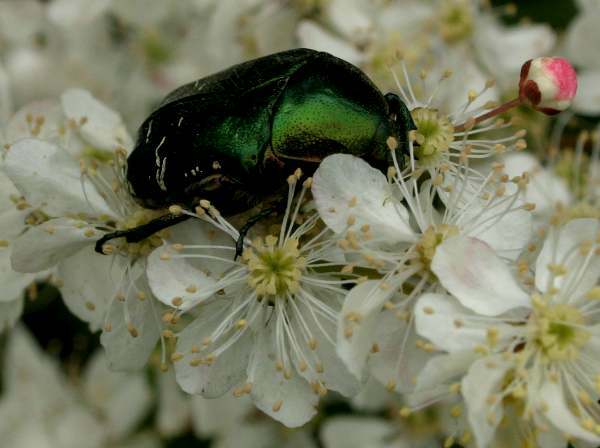 Near towns and villages it is therefore very difficult to determine whether plants seen in the countryside are truly wild. Filipendula comes from the Latin noun filum, a thread, and the Latin adjective pendulus which means hanging - a reference to the way that the underground tubers hang upon fibrous thread-like roots. 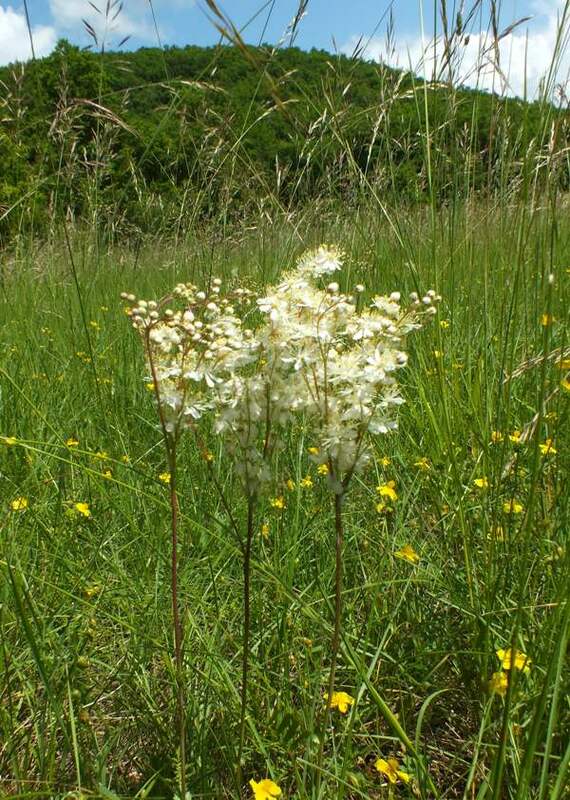 The specific epithet vulgaris means common (although in most parts of Britain and Ireland Meadowsweet is far more common than Dropwort). Meadowsweet Filipendula ulmaria is a larger, more common plant and tolerates wetter pastures, including acidic land. 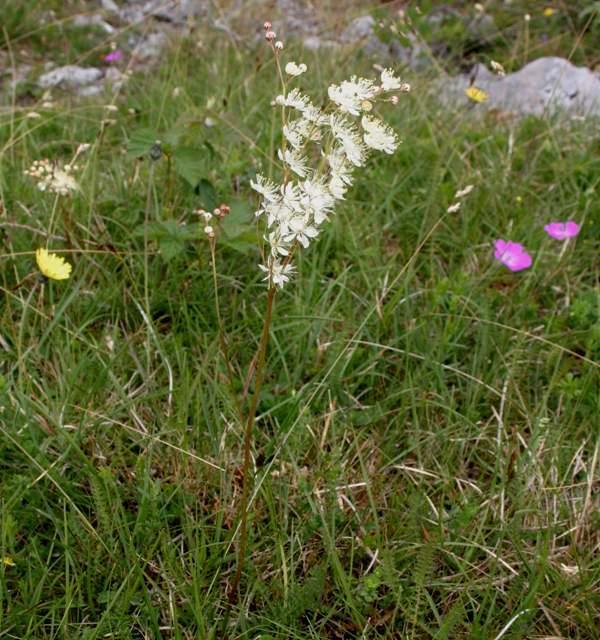 The Dropwort plants shown on this page were photographed in The Burren, in south-west Ireland.